More than 100 Clearwater Beach residents plan to pack a city meeting Thursday. They say they’re furious and flabbergasted over plans to expand a hotel in their quaint section of the beach. CLEARWATER BEACH, Fla. — More than 100 Clearwater Beach residents plan to pack a city meeting Thursday. They say they’re furious and flabbergasted over plans to expand a hotel in their quaint section of the beach. The residents live in an area called Clearwater Point on the South end of Clearwater Beach, tucked away from the hustle and bustle. “Nobody knows about it. We love that!” Susan Watt said with a laugh. She and her neighbors Tom Brady and Rudy Michalek refer to the area as Heaven. “This is one of the laid back parts right here where we live. We want to keep it that way,” Brady said. "It has a real neighborhood feel," Michalek chimed in. Yet, they say trouble may be brewing in paradise as Clearwater leaders consider a plan to more than double the size of the small suite-style 25 room Chart House hotel next to their condo buildings and turn it into an 8-story, 60 room hotel with 80 parking spaces. Hundreds of Clearwater Point residents signed a petition against the project. Their biggest concerns: noise and traffic. “We’re going to have a major problem getting out of here. Right now if you go down Coronado in high season it takes two hours to get off the beach!” Brady explained. The developer of the hotel, Decade Properties based in Wisconsin, estimates the new hotel will add around 502 car trips in and out of the area a day. They promise if the hotel renovation is granted, they will strictly follow the city’s noise ordinance. 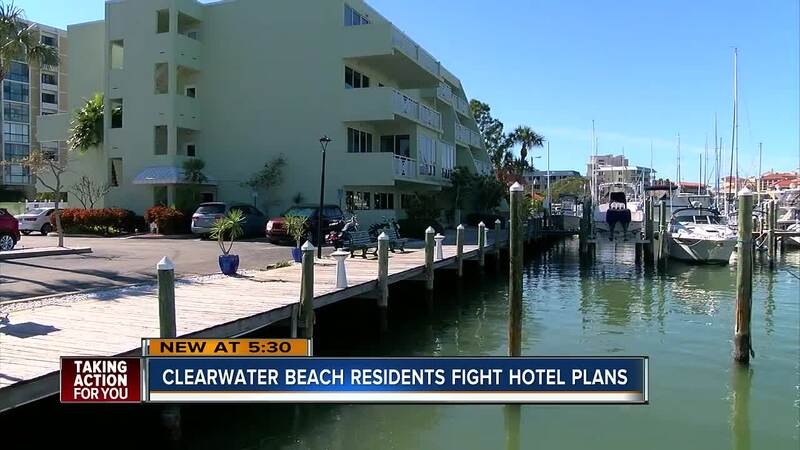 Clearwater Beach leaders also say there are no concerns about the city's sewage system and infrastructure being able to handle a larger hotel. Vacationer Dave Wood welcomes the new project. “It gives you a variety of places to stay,” he said while walking to the beach. He argues it also creates more competition on an island that’s added 11 hotels in the past 15 years, with two more expected to be under construction later this year. “If more hotels come in, it might keep the price down a little bit,” Wood added. “If this happens and it builds up, it ruins everything,” Brady said with a sigh. Clearwater leaders plan to possibly host a second public meeting on February 7 before taking a vote on the project.